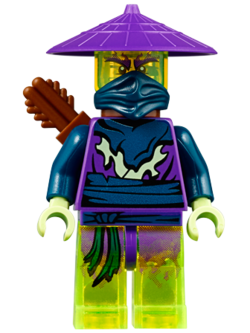 Ghurka is a Ninjago minifigure released in 2015. Ghurka uses the same design as Cyrus, Pyrrhus, and Cowler. This is a description taken from LEGO.com. Please do not modify it. (see an archive of the product's page) Ghurka is a pretty powerful ghost, with only one big weakness: he's scared of ghosts. He often goes into battle with his eyes closed, yet remarkably rarely misses a shot with his crossbow. His distaste for seeing other ghosts means Ghurka is often sent out as a one-spirit battle squad, striking fast and then disappearing. Ghurka is a pretty powerful ghost, with only one big weakness: he's scared of ghosts. He often goes into battle with his eyes closed, yet remarkably rarely misses a shot with his crossbow. His distaste for seeing other ghosts means Ghurka is often sent out as a one-spirit battle squad, striking fast and then disappearing. This page was last edited on 20 August 2016, at 21:04.